Carbon footprint. This is a term we are hearing used more often, but what really does that mean? Carbon footprints are often thought about in terms of transportation habits. However, every person’s carbon footprint is comprised of much more. Did you know that you can actually estimate your carbon footprint? Calculators can measure a variety of variables to reach a good estimation of your total annual carbon consumption. To calculate your individual carbon footprint, The Nature Conservatory has a simple to use, free calculator at www.nature.org/en-us/get-involved/how-to-help/consider-your-impact/carbon-calculator/. It takes into account travel, home, food, and shopping habits, and will report your carbon footprint in tons of carbon dioxide per year. It also will show how you rank compared to the average consumer. Once you understand what your impact is, you can consider ways to reduce it. The same Nature Conservatory website has recommendations for reducing your transportation, household and shopping impact. More locally, the Holland-Hope College Sustainability Institute website, hope.edu/sustainability-institute, includes resources to help community members reduce their environmental impact. These resources include information about Holland’s Home Retrofit Program, greening your commute, as well as looking local first when buying things. 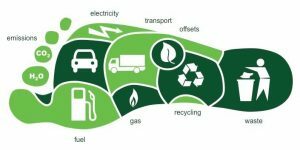 Ultimately, the quickest and most significant step to reduce your carbon footprint is to reduce or eliminate consumption where possible. Purchasing less, changing your diet, unplugging unused electronics, and utilizing natural light can quickly reduce carbon impact. This chart shows the sources of greenhouse gases in the Holland community’s carbon footprint. The total of 735,200 metric tons in 2015 is down from 795,200 in 2010. The City of Holland is also monitoring the whole community’s impact in terms of greenhouse gases as part of its 40 Year Community Energy Plan efforts. Find out more at https://www.cityofholland.com/sustainability/holland-community-energy-plan. 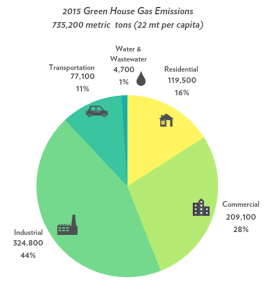 In 2010, Holland’s carbon footprint was 24 metric tons per capita. By 2015, it was down to 22 tons. With the impact of reductions at the Holland Energy Park, that 2017 number is estimated to have gone down to 17 tons. So why should you care? Monitoring your individual impact will give you power over your consumption habits. It’s easy to think that our individual impacts may seem insignificant. However, collectively as a society, as we make these changes, we will start to see the impact of these changes.  Karey Frink is an intern for the Holland-Hope College Sustainability Institute and will be graduating from Hope College in December with a degree in communication and a minor in environmental science.